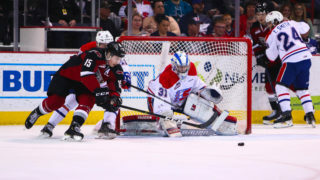 Tonight in Spokane, the Vancouver Giants look to match their season-long winning streak (five games) when they take the ice against the Spokane Chiefs for just the second time this season. The Giants are coming off a spirited 5-4 overtime decision Wednesday in Kennewick, WA while the Chiefs have won four straight and are 8-2 in their last 10 as they look to make up some ground on the Portland Winterhawks and Everett Silvertips in the challenging US Division. Tonight’s game marks the first time these teams will have faced each other since September 30th. Last Game: An 8-3 home victory last Saturday night against Tri-City at home. Coming into tonight’s game, the Spokane Chiefs have the best power play in the entire WHL boasting a success rate of 28.7 percent. Over the course of their four-game winning streak, the Chiefs are 7-for-13. Only the Portland Winterhawks have scored more power play goals than the Chiefs this season. The Chiefs have accomplished this fact despite having the second fewest power play opportunities in the Western Conference. Who’s had the fewest you ask? 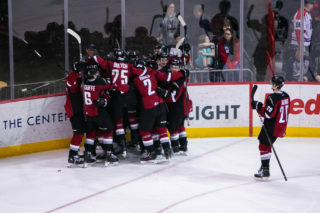 The Vancouver Giants. Not only does New Jersey Devils prospect Ty Smith lead his team in scoring with 48 points, but he also leads all WHL defencemen in scoring. Smith was the first WHL player picked in the 2018 NHL Draft, and he comes into tonight’s game riding a four-game point streak. In that span he’s notched a goal and eight assists for nine points. The matchup tonight between Ty Smith and Bowen Byram will be intriguing because it pits the WHL defensive points leader (Smith) up against the WHL’s leading defensive goal scorer (Byram). 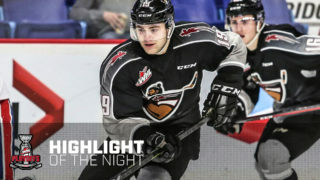 Byram will be looking to follow in Smith’s footsteps as he takes aim at becoming the first WHL d-man selected in the 2019 NHL Draft. After missing just two games over the past two seasons, Jaret Anderson-Dolan’s season has been marred by injury up to this point for Spokane. The Los Angeles Kings prospect suited up in five games with the Kings earlier this season before being returned to junior. Anderson-Dolan has also missed time because of the World Juniors where he suited up for Team Canada. In six games with Spokane he’s scored three goals while adding six assists. He’s one of most dynamic, fast forwards in the entire WHL and the Giants will need to do everything in their power to contain him tonight. Over the past four games, Davis Koch (3G, 8A), Jadon Joseph (3G, 3A) and Tristen Nielsen (2G, 6A) have combined for 25 points. They have been remarkably consistent and not only in the offensive zone. Jadon Joseph made a key shot block on Wednesday night in the third period which helped keep the game tied 4-4. The trio has found instant chemistry together and they’ll look to continue their positive play and point streaks tonight in Spokane. He was named CHL and WHL Player of the Week last week. So far this week he’s already bagged two goals, including an overtime winner. 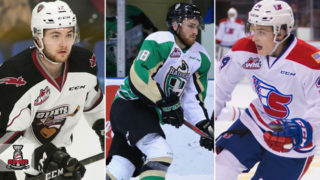 He’s got a seven-game point streak where he’s notched six goals and eight assists for 14 points and he leads the entire crop of WHL defencemen with 15 goals. He had one goal and one assist against Spokane earlier this season. Friday night in Spokane to face a Chiefs team that is 24-13-2-2. Saturday night back home to face Moose Jaw who are currently 23-11-5-2 and 6-3-0-1 in their last 10. Coming up Thursday the Giants have the top team in the CHL, the Prince Albert Raiders coming to town. This is as tough a stretch as the Giants will endure all season, coupled with some travel thrown into the mix. 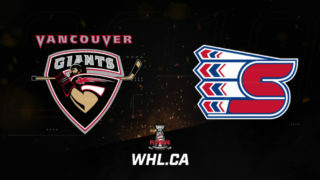 The Giants have already earned themselves a split on their current two-game road trip, but the energy, confidence would be sky-high if the Giants can band together tonight to beat a tough Chiefs team in one of the toughest buildings to win at in the entire WHL.